Fakenham Museum of Gas and Local History01328 863507work MuseumBefore North Sea Gas became available gas was made by heating coal in closed vessels called retorts. Fakenham's gas works is the only remaining example of this Victorian technology in England and Wales. It provides an insight into an industry and the working conditions of over one million people who were employed in making, maintaining and supplying 'town gas' between 1800 and 1965. Provision of gas enabled the streets and houses to be lit after dark and greatly assisted domestic chores for housewives. Displays of local history items illustrate life and work in the market town of Fakenham. Before North Sea Gas became available gas was made by heating coal in closed vessels called retorts. Fakenham's gas works is the only remaining example of this Victorian technology in England and Wales. It provides an insight into an industry and the working conditions of over one million people who were employed in making, maintaining and supplying 'town gas' between 1800 and 1965. Provision of gas enabled the streets and houses to be lit after dark and greatly assisted domestic chores for housewives. Displays of local history items illustrate life and work in the market town of Fakenham. Comments include 'very interesting', 'fascinating' and 'please keep it open so people can see an important part of Britain's industrial history'. The Museum has been supported by the National Lottery Fund and received a Norfolk Tourism Award in 1995. Booklets about local history are available and historical town walks, guided or with itinerary are available. Group bookings are welcome (less than 35 recommended) at mutually convenient times. Please allow at least one hour for visit. Donations requested. £3 per person recommended. From the A148: From King's Lynn, turn right at roundabout, then left as for East Dereham and left again for town centre. Museum is on right before river bridge. 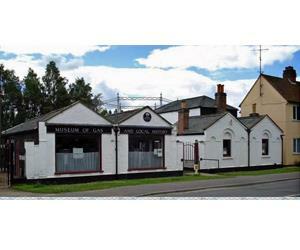 From King's Lynn station it is 20 miles to Fakenham Museum of Gas and Local History.